Introducing Australia's first UHF & VHF handheld radio ideal for land and marine communications. Floating and Lightweight Design**, the new MHS155UV is fully Submersible and Waterproof* and simple to use. Perfectly suited for all marine and land applications, the MHS155UV is equipped with a table-top drop-in charger allowing you to conveniently charge your unit. This compact two-way radio is certified to meet the world standard JIS7/IPX7 waterproof level. The MHS155UV is the ultimate in Dual Band VHF/UHF communications and built for rugged Australian and New Zealand conditions making it ideal to communicate to and from the boat to land whether it may be a beach ride, campsite or inland communication post. 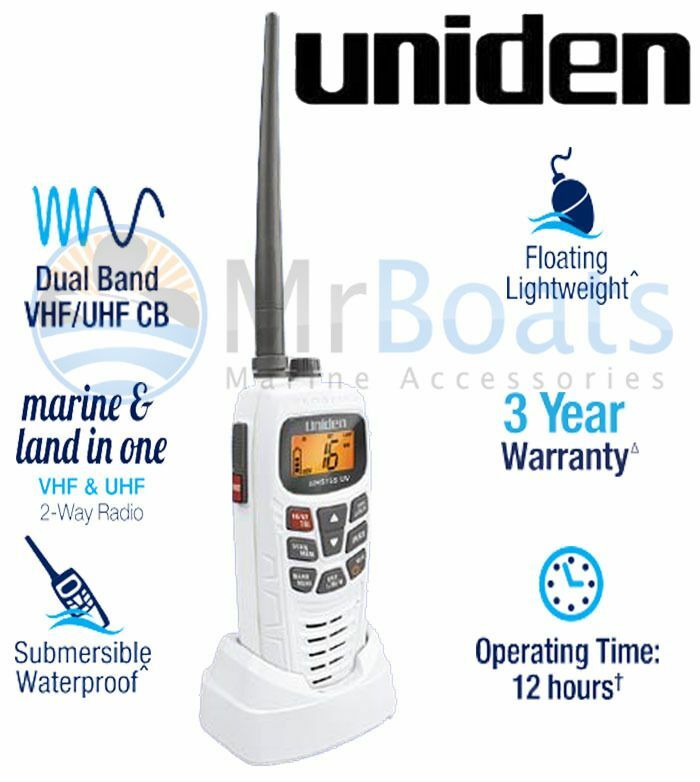 Uniden's reliability and experience in VHF/UHF makes this unit suitable for the professional who needs to keep in touch with the outside world. The MHS155UV offers the finest components, engineering and styling and offers outstanding performance in virtually all conditions and situations. The MHS155UV is a Radio Built Rugged for Australian/New Zealand conditions. The MHS155UV has a Large LCD Display and glow seals for easy viewing.